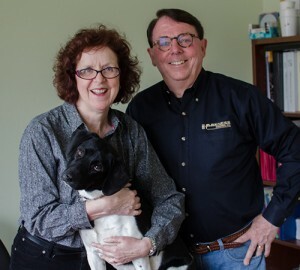 Bob and Nancy Williams, owners of Harkness Industries. When a nice couple wants to run a business together, visions of a picturesque bed and breakfast or a quaint neighborhood coffee shop comes to mind. If that couple wants to leverage an extensive background in business management, engineering, sales, customer service and quality assurance then they end up running a leading manufacturer of precision cast urethanes, custom injection molding and unique profile extrusions — Harkness Industries.Bob and Nancy Williams purchased Harkness Industries in 2001 after successfully advancing to executive positions at large, multi-national engineering companies. Following months of research and analysis, the Williams took the gargantuan leap of faith in each other and their collective abilities, and purchased Harkness Industries. Not far from Williams’ offices at Harkness, you will find Addie, the couple’s rescued pup who thoroughly enjoys going to work with Mom and Dad every day.